In the pre-1952 period, the Niger Delta pastorate with headquarters in Bonny was in charge of Church affairs including the area, with constitutes the present Diocese of Aba Ngwa North. However, in 1952, the Niger Delta Diocese was created out of the Diocese on the Niger with Aba and Bonny as the only two Archdeaconries. The Cathedral then was at St. Stephen’s Bonny while the administrative headquarters was at St. Michael’s Aba. Aba Archdeaconry had all Saints Abayi –Umuocham as the Archdeaconry headquarters. As a result of rapid spiritual and numerical growth as well as expansion in Aba Archdeaconry comprising Aba (Ngwa), Umuahia and Ukwa, the Archeaconry was made a Diocese in 1972.The Diocese of Aba developed fast and with time Umuahia and Ukwa became Dioceses of their own (1994). With more awareness and in an effort to have a balanced Church growth as well as for easier accessibility to the Cathedral, the throne of the Bishop, the demand for the creation of more Diocese, notably Isiala Ngwa and Aba Ngwa North began. Without going into details it needs to be said that the clamour for he creation of the Diocese of Aba Ngwa North started in a humble way in 2001 when on 19th May, 2001 the application for the creation of the Diocese was made. This was as a result of the pronouncement by the then Lord Bishop, the Rt. Rev. Prof. A.O Iwuagwu in his presidential address during the 2000 synod held at St. Augustine’s Church Okpu-Umuobo that “for evangelical reasons, new Dioceses will be created out of the existing Aba Diocese. We are convinced under God, that we can create two or three more Dioceses”. After the usual protocol that follows such applications, the Diocesan Board, on 7th July 2011 approved the creation of he proposed Dioceses of Aba Ngwa North and Isiala Ngwa. This approval was ratified by the Synod that held at St. Michael’s Cathedral, Aba same year. The approval and subsequent ratification paved the way for writing of an Application booklet for the Church of Nigeria (Anglican Communion). On 6th November, 2002 following a successful application, the inspection team organized by the Church of Nigeria, Anglican Communion Headquarters, Abuja came to Abayi-Umuocham, the seat of the proposed Diocese, unfortunately the request could not scale through as it was said that the people were not ready since certain requirements were not in place, the people of the proposed Diocese felt demoralized. In a renewed vigour and determination to achieve the set goal and to avoid the setbacks of the past, our well-focused Bishop, the Rt. Dr. Ugochukwu Uwaoma Ezuoke posted an able spiritual leader, Ven. Emmanuel C. Amadi to Abayi-Umuocham, the seat of the new Diocese with a clear mandate to ensure the actualization of the proposed Diocese. Ven. Amadi accepted the challenge, braced himself for the task and saw it happen. Ven. Amadi had the support and encouragement of a steering committee composed of able and seasoned men and women. With sustained effort of these men and women led by Mr. O.C Atuzieogu, JP (chairman) who took over when Chief Onyeukwu Onyenso died, The Primate Most Rev. Peter Jasper Akinola on 18th February, 2006 visited All Saints Cathedral, Abayi Umuocham (accompanied by the Bishop, Rt.Rev. Ugochukwu U. Ezuoke) to conduct an on the spot inspection to ascertain the level of preparedness for the creation of the Diocese. Consequently and by the special grace of God, the Diocese was created later in the year. The enthronement of the first Bishop of the Diocese, the late Rt. Rev. John Ezirim took place in April, 2007 who died in 2008. After his demise in 2008, the incumbent, Rt. Rev. Nathan Kanu was elected by translation (from USA) to be our bishop in accordance with the provisions of the aforesaid Constitution of the Church of Nigeria. Therefore, following the foregoing, Rt. Rev. 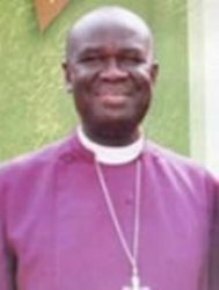 Nathan Chinenye Okechukwu Kanu, PhD, JP, was on 29th April, 2009 enthroned as the second bishop of Aba-Ngwa North Diocese.